To compare the propensity of three common hand-drying methods (jet air, warm air dryers, and paper towels) to contaminate the environment, users, and bystanders. Hands were coated in lactobacilli to simulate poorly washed, contaminated hands, and dried. The investigation comprised 120 air-sampling tests (60 tests and 60 controls), divided into close and 1m proximity from the drying process. Separate tests used hands coated in paint to visualize droplet dispersal. Air bacterial counts in close proximity to hand drying were 4.5-fold higher for the jet air dryer (70.7cfu) compared with the warm air dryer (15.7cfu) (P = 0.001), and 27-fold higher compared with use of paper towels (2.6cfu) (P < 0.001). Airborne counts were also significantly different during use of towel drying versus warm air dryer (P = 0.001). A similar pattern was seen for bacterial counts at 1m away. Visualization experiments demonstrated that the jet air dryer caused the most droplet dispersal. Jet air and warm air dryers result in increased bacterial aerosolization when drying hands. 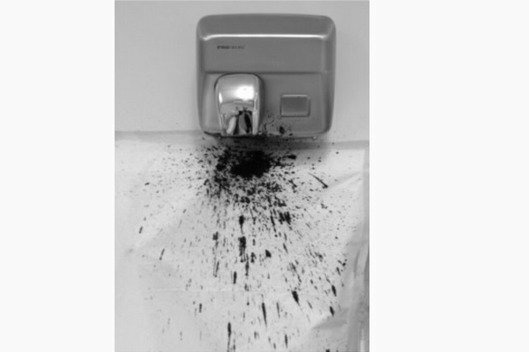 These results suggest that air dryers may be unsuitable for use in healthcare settings, as they may facilitate microbial cross-contamination via airborne dissemination to the environment or bathroom visitors. Restroom Hand Dryers Spread More Germs Than Paper Towels, Study Finds — WebMD. This is what happened when people who had their hands coated in paint then used the drier. Overall, as many know, I am driven batty by the rampant and excessive germophobia out there. However, in this case I think it is useful knowledge to know how different hand drying methods work. I have always prefered paper towels for many reasons, now a bit more so. This story reminds me a bit of the work of Norm Pace who has been telling people for years about how showers vaporize microbes in water and in the biofilms on the shower pipes and thus may be contributing to aerosolization of nasty microbes. @phylogenomics But this assumes you did a bad job of washing the "bad" bacteria off your hands in the first place? So focus on good washing? @phylogenomics Use neither towels nor drier. A bit of hand flapping while walking from wc to office air dries my hands. Saves trees, energy. @eswillwalker @phylogenomics Or, if you are wearing your field clothes, the back of your pants. Lesson: always wear field clothes. @eswillwalker My department has those fabric towels on a roll that always get stuck and are always wet. They are the most vile things.